The bill's supporters hope to modernize labor legislation and ease union regulations, generating more jobs and boosting Brazil’s weakened economy. SÃO PAULO, BRAZIL – A controversial labor reform bill was approved by Brazil’s Chamber of Deputies in the early hours of Thursday morning by 296 votes in favor and 177 votes against. With the bill the government hopes to modernize labor relations, reduce union requirements, encourage investments and generate more jobs, boosting Brazil’s weakened economy. Labor reform bill vote at Chamber of Deputies faced strong opposition on Wednesday night, photo by Antonio Cruz/Agência Brasil. “The result obtained is an expression of the broad majority opinion that has formed in Brazilian society around the need to adapt labor relations to the realities of the present and to prepare our labor market for the demands of the future,” said President Michel Temer’s spokesperson, Alexandre Parola told reporters on Wednesday night after the main bill was approved. 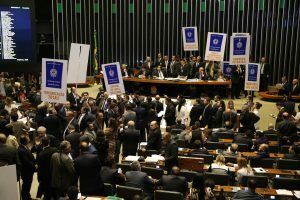 The spokesperson went on to say that President Temer thanked party leaders, governors, mayors, and business and trade union representatives who worked decisively in favor of approval of the bill in the House and would expect the ‘same degree of engagement’ as the bill is discussed and voted on in the Senate. Government allies later rejected amendments to the bill, introduced by opposition lawmakers, and the original wording of the bill was kept. The bill, which now goes to Brazil’s Senate for approval, allows for negotiations between employer and employee and collective bargaining agreements to override what is written in the legislation. Union representatives will no longer be required to assist the worker in the termination of labor contracts. The mandatory union contribution paid by employees will be extinguished and employer and employee, in consensus, will be able to terminate the employment contract. In this case, the employer will be required to pay half the fine it now is required to pay. The bill also renders more guarantees to outsourced labor and eases restrictions on temporary workers. The Lower House’s approval comes a day before a scheduled nationwide general strike called by labor unions and organizations which have criticized the bill, calling it a major blow to employees’ rights.